The alpines for beginners featured below are reliable performers, and are easy to grow, unlike more challenging rock garden plants. In nature, alpines grow above the tree line in mountainous regions. They can be bulbs, perennials or woody plants, but what they have in common are tight clump forms and an ability to thrive in windy, gravelly or rocky places. 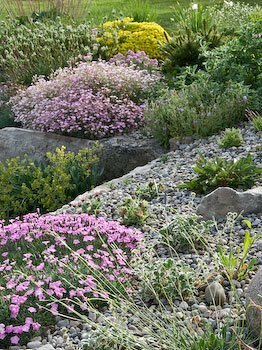 A rock garden, as opposed to a “rockery” – a flower garden studded with rocks – showcases alpine plants. These plants tend to be small and tight in growth habit, but they have many flowers that bloom in gorgeous gem-like tones in spring and early summer. Aubrieta (rock cress): White, rose, purple flowers in spring; cushion-forming; cut back after flowering to maintain compact shape. Campanula (bellflowers): Many suitable types: C. portenschlagiana (Dalmatian bellflower), neat mounding habit; abundant bluish-purple flowers in mid- to late summer; C. poscharskyana (Serbian bellflower), fast-spreading trailing habit; star-shaped lavender flowers in late spring/early summer; C. carpatica (Carpathian bellflower), low growing, blue or white flowers in spring through summer. Dianthus (pinks): Dianthus deltoides (maiden pink) is a mat-forming perennial that is among the easiest alpines for beginners; has a profusion of single flowers in late spring/early summer; pink-, white- or red-flowered varieties available. D. gratianopolitanus (cheddar pink) blooms in early summer with spicy, fragrant rose pink single flowers. Draba: A very satisfying alpine genus for beginners; cushion- or hummock-forming rosettes of leaves and numerous small cross-shaped flowers in yellow or white. Geranium (cranesbill or hardy geranium): G. cinereum, low-spreading type with lobed leaves and saucer-shaped spring-blooming flowers in pink, lilac and magenta; G. dalmaticum has shell-pink flowers in late spring/early summer. 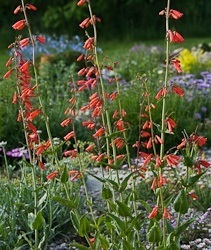 Penstemon (beardtongue): Native to North America; irregular-shaped flowers with tubular upper and lower lips; dislikes excessive heat and humidity; try P. barbatus ‘Elfin pink’ or P. hirsutus ‘Pygmaeus’, which has lilac flowers.P. eatonii flowers scarlet in mid-summer. 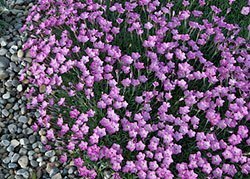 Creeping Pholox (Phlox subulata): Popular, easy-to-grow rock garden plant; blooms several weeks in spring; pink, white, blue, magenta flowers cover mounds of needlelike foliage; shear after flowering to maintain compact form. 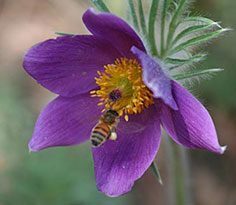 Pulsatilla (pasque flower): Showy in early spring; finely dissected fernlike leaves; silky bell- or cup-shaped flowers in lavender or purple. 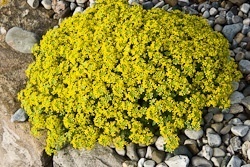 Saxifraga (Saxifrage): No rock garden is complete without saxifrages; native to mountainous northern hemisphere regions; choose from a vast array; most are mat- or cushion-forming; immense variety of habit and flowering. Sedum (stonecrop): Another easy-to-grow group of rock garden plants; succulent foliage; S. spurium ‘Tricolor’, variegated green, cream-white and pink leaves; S. sieboldii, clusters of pink flowers in September and October. Sempervivum (hens and chicks): Tough, easy to grow alpines for beginners; succulent rosettes thrive in rock cracks and crevices.